In each episode of the Roll for Topic podcast, we randomly determine a topic of conversation by rolling a d10 and consulting the table below. Once we’ve discussed a topic, it’s removed from the table and replaced by a new topic. How do you draw a player back in when they’re bored or distracted? When do you roll behind the screen or in front of it? How do you manage enemy and NPC hit points? How do you introduce a non-gamer to your game? (novels, boardgames, videogames, etc.) have you brought into your RPGs? How to run a game in two hours or less (episode 1). Rolled 9. How to handle it when game sessions get derailed (episode 2). Rolled 10. How to use a dungeon master’s screen (episode 3). Rolled 6. Props/handouts and when to use them (epsiode 4). Rolled 5. Bringing elements from other game systems into your game (episode 5.) Rolled 2. Techniques to keep combat moving (episode 7). Rolled 1. How do you deal with severe consequences to player actions (episode 8). Rolled 1. 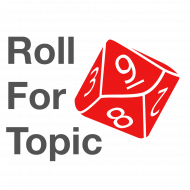 Roll for Topic, Proudly powered by WordPress.